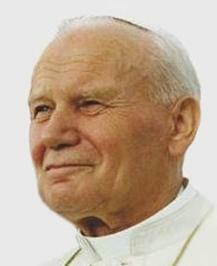 The Venerable Pope John Paul II (Látìnì: Ioannes Paulus PP. II, Ítálì: Giovanni Paolo II, Pólándì: Jan Paweł II, Faranse: Jean Paul II, Jẹ́mánì: Johannes Paul II), born Karol Józef Wojtyła (Àdàkọ:IPA-pl; 18 May 1920 – 2 April 2005) served as Supreme Pontiff of the Catholic Church and Sovereign of Ìlú Fatikan from 16 October 1978 until his death over 26 years later. Pópù Jòhánù Páúlù Èkejì je Popu Ìjọ Kátólìkì tele. Àtunṣe ojúewé yi gbẹ̀yìn wáyé ni ọjọ́ 24 Oṣù Kẹta 2018, ni ago 10:46.